I would lust after Kentucky Fried Chicken and would feel really bad after eating it. Not from a guilt point of view due to unhealthy indulgence. Nope, I really do physically feel bad after finishing the last piece of fried chicken that has been secretly embalmed with 11 herbs and spices. It always leaves a peculiar after-taste that can be described as a bad combination of sickeningly creamy grease, refrigerated overnight chicken soup and sweaty salty skin. Which is like the new Dan Brown book, The Lost Symbol. While I couldn’t resist the marketing messages which promoted this book like it is the sequel to the Holy Bible, the feeling that I get after completing it can be described as a bad combination of sickeningly ill-constructed scenes and dialogues, refrigerated plots from previous books and conspiracy theories and non-sweaty predictable plot twists. In this novel, Dan Brown took familiar plot elements from The DaVinci Code, Angels & Demons, Deception Point and Digital Fortress and transported the story to Washington D.C. This time around, a diabolical and murderous villain with the moniker of Mal’akh forces Robert Langdon to once again solve puzzles based on long lost symbols. I wouldn’t write anything more about the plot because the book has nothing else going for it and I do not want to spoil it in case one wants to read this book or wait for the Tom Hanks movie version of the book. What I’ve discovered when reading The Lost Symbol is that Dan Brown has unabashedly recycled plot elements and characters from his old novels. (For those who do not like spoilers, skip to the last paragraph now). The saving grace to this book is that with all the flaws it is still fun to read. That is if one lowers one’s expectations enough to read it for the pulp fiction value that it is and nothing more. dsdI have a confession to make. 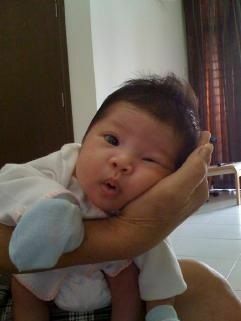 Recently, we went to the paediatrician to give Chloe her shots. I was pretty blown away by how much we have advanced as a human race since I last got my compulsory shots. Nowadays, they have super 6-in-1’s or 9-in-1’s that is able to immunize baby from Hepatitis to Hong Kong Feet (okay, maybe not but but they should for our olfactory challenged friends). Seeing all this advancements reminded me of the times when I upgrade the operating systems of the computers that I own. Microsoft and Apple will always advertise (as you are installing their Operating Systems) that you are installing one of the most advance piece of software that money can buy. After spending 40-60 minutes waiting and seeing the status bar trudging along slowly from 0 to 100%, the machine will herald triumphantly that it is ready to boot using the new Operating System. Upon first boot, one will then be confronted by windows popping up asking for you to download gigabytes of updates, service packs & patches because the most advance software that money can buy just got outdated from the time it left the store to your house. Which is very similar to the human race today. Babies are born to be as perfect as our last benefetial genetic mutation. However, between the time from that mutation to now, there are viruses that can cause a great deal of harm if the body is not “patched” to fight those viruses. Looking at the schedule of shots that they have today, I would think that newborns will have a pretty traumatic & painful childhood. I’m just gald that babies don’t come with accessories like camera or scanners. Patching the device drivers for those suckers is hell. Being a new parent is like being on perpetual standby: you are never going to prioritize anything above the welfare of your baby. Take for example my favourite hobbies. Assuming if I can find time first to indulge in them, my enjoyment of watching a DVD is contingent upon Chloe not crying during the duration of the movie. When Chloe cries, it doesn’t matter if Liam Neeson is in the middle of saving his daughter while single-handedly taking down the human trafficking gang in Taken, the movie stops and Chloe gets full attention. The same goes for books and magazines, which have reverted to be nothing more than loose reading materials akin to those in doctor’s waiting lounges. They are there for you to pass the time before you have to attend to something more important like your baby’s cries. The attention required by a baby is just tremendous. Being so helpless, they rely on able-bodied adults to do their biddings. The weapons at their disposable are their ear piercing cries and their disarmingly cute face. And both in combination, when used in varying proportions, always induce a fully-grown adult to revert to a drone bent on fulfilling baby’s desires. Chloe’s Close-Up, originally uploaded by CeeKay’s Pix. One of the most frequent reply that I got on SMS amidst all of the congratulatory messages was that I have to bid farewell to my nights. Little did I know that the senders were dead serious. On average, I had slept no more than 4 hours per night since Tuesday. There were times when I was lucky enough to sleep for 2 hours straight. In the morning, I was rushing around, trying to get one thing or the other done. But something in her brings out that extra ounce of energy in yourself that you need to push yourself further beyond your breaking point. After starting the day being heavily deprived of sleep, I was rushing from the one place to another, buying last minute baby items and ensuring that Cheryl is comfortable so that she can recuperate. After all that helter skelter of a day, as I was about to fall asleep, a tiny cry came from the crib in our room at 2.30am. I walked there, feeling tired and I saw a priceless stare (as captured in this photo) from Chloe. She could have asked me to walk to the moon and back and I would have happily complied. Luckily, for her and for me, she didn’t. However, 10 minutes after the photo was taken, she wailed until 4am. After trying all methods from feeding to swaddling, she eventually fell asleep on her mother’s bosom. Babies are designed cute to elicit an emotional response from their parents to provide for them comfort, food and attention even though they could only cry and wail. After experiencing this first hand, I must conclude that this is probably one of the most brilliant evolutionary development in the human race. Introducing Chloe Koay, originally uploaded by CeeKay’s Pix. It was scheduled for tomorrow but she just couldn’t wait. Cheryl was having contractions last night and it persisted until this morning. Fearing that we were going to go into labour, she called up Dr. Ravi who asked that we come in within the hour. Upon arrival, Cheryl was strapped to some thing-a-magics that could detect contrations, her heart rate and baby’s heart rate. When the doctor arrived, he advised that we go ahead with the C-section today rather than the scheduled one tomorrow. I was then whisked away to don on the blue surgeon robe while they prepped up Cheryl for the spinal anesthetic. We met again in the operating theater and the baby Chloe out less than 15 minutes into the procedure. We are very grateful that the baby turned out okay and our heartfelt thanks to Dr. Ravi who handled the whole procedure professionally and to the staff of Gleneagles Intan Ampang who were very helpful. City Hall Oslo, originally uploaded by CeeKay’s Pix. I haven’t been to Scandinavia since the days when I was still in Cell Network, which was a good 6 to 7 years ago. Recently, I was in Oslo for work. Perhaps not a lot of people (outside of the telco industry) know that DiGi is owned by the Telenor group. We are part of the 7th largest telecommunications company in the world. We managed to take some time off to see Oslo. I’ll be uploading some photos as I get the time to do it.